It seems WP want the Reader to fit on a cellphone, but wouldn’t the format below be better for all ? It makes maximum use of the available space by hiding the menu (or by spreading it along the top bar), minimizing the white space and fitting all pictures into a 4:3 frame without cropping. Modified 21 Dec 2016. More↓. There are icons for a full gallery view (pics), plain reader (read) and visit the blog (visit). The gallery icon shows the number of images on the post and changes colour if there are more images than shown by the reader. A click-on the left side larger image will expand it. This alternative uses a little more height than the new Reader, but far less than the previous Reader, is more accommodating and even looks better on a cellphone than the current new Reader. The present load speed problem is partly due to the extra data transfer junk (e.g. Google Analytics, Google Ads, Olark, WordPress Public API and many more) and partly due to the larger number of posts (in thin slices) being loaded at one time. Although the number of posts being loaded at one time might be less for those using a mobile application. The fonts and juxtapositions aren’t brilliant, but it conveys the idea. Next week, I’m teaching it to do singing and dancing. The point of this exercise being; to show what can be done and encourage WP to consult in future. And, of course, stop WP from pushing their recommendations into our reading lists. More on the Reader here ⇐. This entry was posted on December 21, 2016 by Graham in Hats. It was filed under WordPress Changes and was tagged with alternative wordpress reader, Changes to Wordpress Reader, Recent WordPress Changes, wordpress, wordpress changes, wordpress reader changes. For those of us who dislike gallery views this does not help, they are fixing the crop. I want a choice as to whether my photos appear in a gallery or not. Point taken. There should be an option. An embedded code in the post would work, if WP were willing to use it. 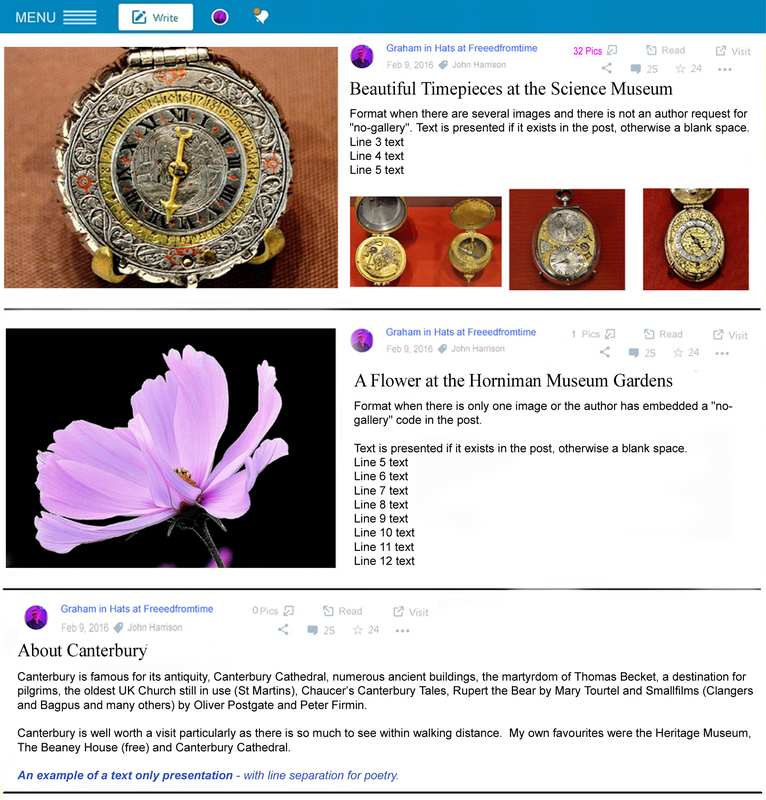 I’ve modified the Reader suggestion with a simulated post “Beautiful Timepieces at the Science Museum 2A” with explanatory note. I hope you find this more acceptable. It doesn’t provide as much segment height as one would like but attempts to address WP’s wishes as well as our own. I’m afraid a compromise is the best we can hope for, if that. I don’t expect that WP will take any notice, even if most viewers approve, but it will show the disadvantage of not consulting with bloggers first. My problem is many of my posts in the next three months are four shots. Which automatically means everything is in Reader in galerry format. I want a choice. I agree entirely. If we can just persuade WP to return a at least one full size rendition it would be a start. Unfortunately they can be quite intransigent. Two years ago the forums were overflowing with complaints about the changed UI and coercive behaviour on the part of WP. The best we could get was a form of stalemate (i.e.the old UI still exists but we need to use bookmarks to access it). It takes a lot of pressure by many bloggers working together to make a difference. But, imagine how bad it would get if we never put up any resistance. Best of Luck. G. :-). If WP cared about photography they would format for landscape and portrait, I a m not expecting miracles, but when I post I great Blue Heron I don’t wan to see belly and when I post four of them I don’t want to see four bellies. This is brilliant! Here is what needs to happen. You need to supervise the automatticians. Thank you. It was an interesting project. Unfortunately they have too much invested in there own work to change now. But I hope to show them the perils of not consulting. “Why do you not show respect to your customer’s choice and let them opt-out of the Reader recommendations. ” . Just Great! I think it’s brilliant since they’re determined to change it. Have they seen your suggestion? Thank you. They haven’t seen it yet. I wanted to get some feedback first. I don’t think they will change now, but perhaps will show there irrationally stubborn side. It’s all grist to the mill.